The substantial category is one that comprises approximately two percent of animal tests in the UK. Despite its small size, however, there is still a great deal of controversy regarding projects performed within this classification, namely due to the significant level of animal suffering and distress. Animals that are tested within this category will suffer from a significant change from their normal state of health and well-being. The substantial classification ensures that a project receives particularly intense and detailed investigation. There is, however, debate regarding this classification, with a focus on the accuracy of the substantial and moderate classifications. The British Union for the Abolition of Vivisection (BUAV) has criticised the British government for not meeting its obligations in regards to the 1986 Animals Act. Examination of one project showed that monkeys were given an extremely invasive brain surgery despite the project being classified as moderate. Also, the animals received little or no pain relievers. This case has prompted the BUAV to demand that experiments involving very invasive procedures receive the substantial classification rather than the moderate rating. These invasive procedures would include ones such as inducing strokes through the removal of the top of the animals' heads. The BUAV's argument stands on the premise that a substantial classification includes a procedure that significantly affects the animal's natural and normal state of health. They argue that the definition itself proves the inaccuracy in how some projects are classified. 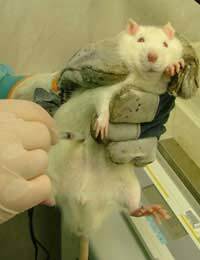 For some experiments, a high level of animal suffering is considered inevitable but these experiments must justify themselves prior to approval. To do so, they must show a direct benefit to medicine and human healthcare. The experimental design receives particular attention to ensure that animal life is not harmed or wasted without reasonable justifiable cause. Still, some groups against animal testing believe that any level of animal suffering is unacceptable. The cases of inaccurate classification serve to further their passion to end animal testing. With the current small number of categories for assessment, poor classification could mean that a project license is granted based on inaccurate information when instead, a license may have otherwise been turned down. Another criticism of the classification system is that the level of suffering can vary greatly throughout an experiment. Thus, the current system is considered not advanced enough to appease the demands of today's testing structures. Still other critics feel that the entire system of classifying animals only prior to experimentation is a poorly structured one because it is relies on projected levels of suffering. They argue that it is no better than an educated 'guess' that could result in higher than projected levels of animal suffering. The alternative here would be a two-phased classification system where animal suffering is projected prior to experimentation and then again after a license is granted and during animal testing itself. While all of this additional assessment and monitoring does place a larger burden on scientists involved in animal testing, it would mean that animal care is improved and that animal testing itself becomes more transparent overall. Ultimately, whether you support animal testing or are against it, the reality is that animal testing does occur. At the very minimum, animal welfare should be maximised at all times. The current classification system is a step in the right direction but will hopefully be improved in the future. Alternative methods such as refinement procedures will also ideally make the mild category the largest one, which means a lower level of animal suffering or distress.